So this gem is making the rounds on facebook now. I inquired with a couple of people on facebook chat and I find out, that it’s for breast cancer awareness. 4 words. Just 4 words. Now being a girl myself, I have taken offence to what I just said. But then I re-read that message and I understand why I said what I said, so I placate myself. Do you care to find out that your sister/daughter is wearing “nothing *hee hee*” when she told you that she was on a study date with the some guy up the street? I didn’t think so. How strange, she's not on facebook. Helen is that you? I lost an aunt to breast cancer when I was very young, and today I despise cotton candy pink of the Susan G. Komen for the Cure Awareness campaign. (Let me say here, that my problem is not with the foundation itself. They do important work everyday- it’s the pink, the campaign designed around it that I abhor. Also, the facebook-color-of-my-bra-status-update has not been attributed to them.) I hate that idiotic pink ribbon and the sorority girls in bouncing pony tails and Juicy Couture track suits who ask you if you’re like to contribute to the campaign all the while, deafeningly cracking gum and smoking Marlboro Menthols. I detest the fact that it’s made into Goddamn pink ribbons and bra color facebook statuses when breast cancer ravages the body and mind of the person who suffers from it. Because pink is not the color of the hours of chemotherapy, pink is not the color of a masectomies, pink is not the color of painkillers and a broken self-image. It’s not fair to throw a large can of pink paint and a few bras at the pain and suffering of millions of women all over the world and think it’s all right. “What we need is not a context-free reminder of its existence, but a cure, as well as some scientific clarity about how best to prevent the disease. Does anyone think the Facebook meme contributes an iota to that? 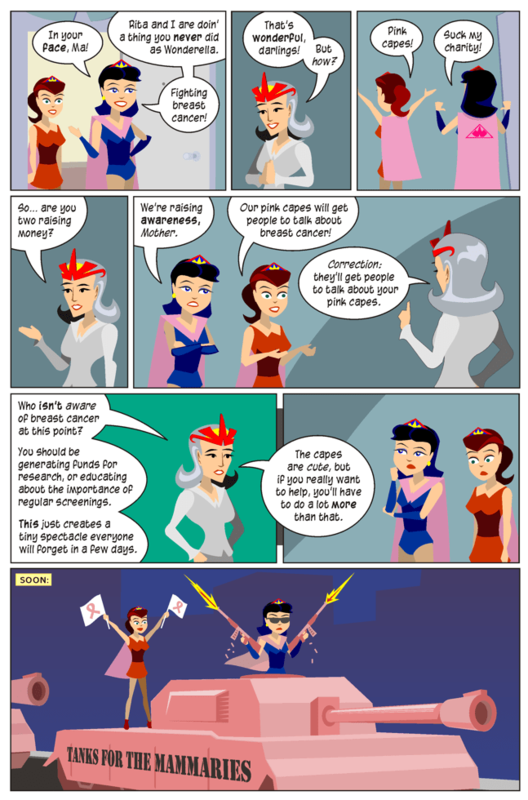 So yes, I’m complaining about is the candy-floss, bubble gum, hey-mickey-you’re-so-fine, cheerleader perception of breast cancer that the world has thanks to our bra-color-updating-friends that still leaves us with no real solutions or tangible awareness. I am in complete agreement. “Attentionwhore” is the perfect description of this; thank you for supplying the word. Could not agree with you more! We just posted about how ridiculous this game is on our blog today. We love your angle about the attention-whoreness of most of these girls. My personal favorite status update yesterday was from a girl I went to high school with: “Blue Leopard Print With Black Lace And A Blue Bow In The Middle.” What an activist! Oh! she’s changing the world, one “Blue Leopard Print With Black Lace And A Blue Bow In The Middle” bra at a time. As a marketing person, I have been trying all day to justify this game, and I still have nothing I can solidly put down in that camp. It makes me angry that this cheap, voyeuristic activity is being carried out under the guise of breast cancer awareness. I’m a fan of any well crafted marketing/promotional campaign, but this just beats any kind of purpose and is disrespectful to the cause. As a survivor of this life sapping disease let me assure you that the pink ribbons that seem sappy to you, have been a lifeline for people like me. Thier very presence represents the will to find a cure. They are the anthem, and the representation of the cause that people rally behind. They are the metaphorically the bouys that allow patients to latch on and hope. They are the reason people donate to the cause. They may be just an annoyance to you, but they mean so much to people like me. The FB campaign may have seemed lighthearted or silly, however it certainly got some of the thinking public to realise that the pretty or colorful bras they wear enclose breast tissue that needs to be cared for. Even prettily wrapped presents are not indestructible. Lets talk about the wrapping to start with. Atleast someone was talking about what we all so readily sweep under the rug. First off, congratulations on your recovery. It’s an admirable thing! I’m glad that you got what you did out of the campaign. I previously worked under someone who was a huge advocate for the Susan Komen for the Cure and she too believed unblinkingly in the pink ribbons. There is nothing wrong with that, they do stand for a lot of things, but there’s a lot of things (such as the physical anguish and mental toll) that they do (as you said) sweep under the rug as well. I’m in no way discounting the good it has done for people, but I’m also pointing out the fact that it’s not all just pink and positive all the time. And I didn’t specifically use the word “sappy” or “annoying” because it’s not “sappy,” or “annoying” to me, it’s disrespectful. In my experience, my aunt suffered immensely and didn’t come out of it. It has, I have to admit, made me jaded about the whole thing. and I know it’s not necessary to have to constantly paint horrifying pictures about Breast Cancer, but in our current day and age with “my-bra-color-is-magenta” brand of activism we need to stop glossing over everything under a sheen of funny flirtations and (as I mentioned) a big bucket of pink paint. We need to stop thinking that we’re being activists by sharing our bra colors and changing the world, one unnecessary detail at a time. Moreover, as a line from the Newsweek article that I quoted said (sic) that there are very few people with an internet connection out there that don’t know about Breast cancer. The word is out, and it’s time to move forward if we feel the need to be activists such as maybe, doing a walk or raising funds.